Next post: Celebrating 30 years of People’s! 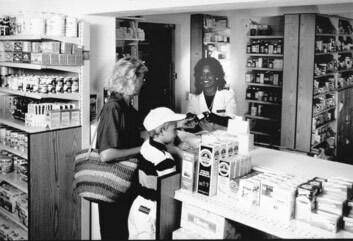 People’s Pharmacy opened its doors on October 31st, 1984. At the time I was 8 years old. Watching my mother and grandfather cut the ribbon to open our doors I was unaware of the impact that one day would have on our family’s future. My family, from that day, has expanded to include the staff and customers at People’s. Our Easters, Mother’s Days, June holidays and every Christmas Eve were spent working together with our family to make this business a success. I can’t remember a school holiday that I didn’t work, I can’t remember a time post 1984 that I have not in some form been mindful of People’s Pharmacy and its needs and I can’t remember a time since we opened that I have not been proud to be a part of this legacy. It’s easy to explain what we do; we work hard every day to provide top notch service to their customers. It becomes a bit more difficult to explain how we do it. We approach each customer as a member of our wider community; we transact with care and concern for their well-being and do our utmost to ensure they get value for money and time spent in our store. What is perhaps the hardest to explain is why we do what we do. I have thought on this for some time and I have finally hit upon the reason, 30 years to the day we first opened our doors. Legacy! People’s is not just a business, not just the story of Donna Pearman, an entrepreneur, a trailblazer and a paradigm shifter, who took a bold step 30 years ago. People’s is our Legacy!